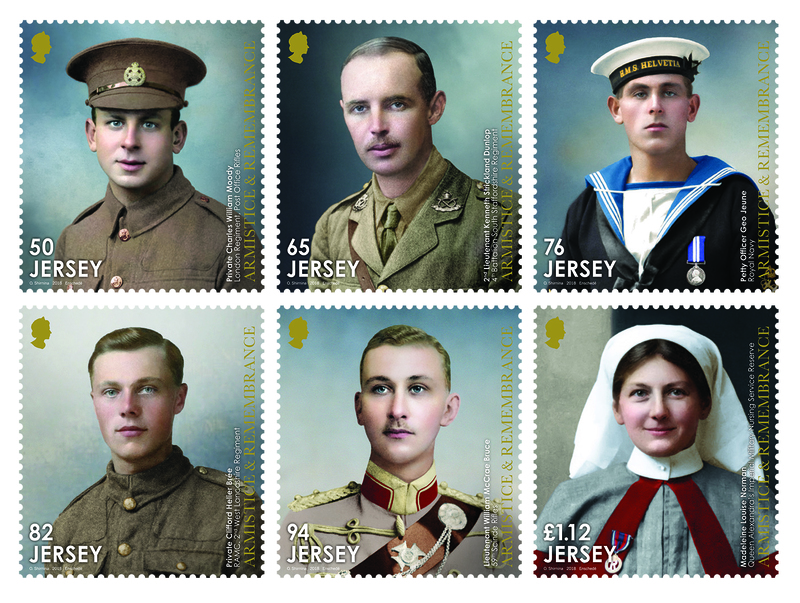 Jersey servicemen and women involved in the First World War are to be remembered 100 years on with a new set of stamps issued by Jersey Post on 4 August 2018. The final part in a series looking back at The Great War, the stamp issue, entitled Armistice and Remembrance, features original wartime photographs which have been restored and colourised by acclaimed Russian historical colourist, Olga Shirnina to fondly remember and offer a new perspective on those who took part. Chris Elligott, Philatelic Artwork and Production Manager explains: ‘The Great War brought together men and women from a variety of backgrounds and it was important for us to show this when selecting the images for the stamps and Miniature Sheet. We didn’t just want to commemorate those who had been decorated, but also those ordinary men and women with extraordinary back stories. The signing of the Armistice treaty on 11th November 1918 signified the start of a period of hope and restoration throughout the nation and to this day, the anniversary remains an occasion for reflection and remembrance. 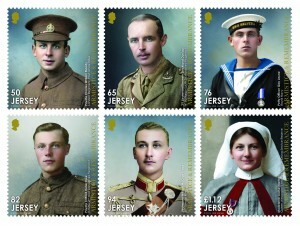 The original black and white images for the stamps have been sourced from the archives of La Société Jersiaise, the Jersey Museum, Victoria College Book of Remembrance and from family members who have given special permission for the images to be used. The names and service of those featured are printed on the stamps. 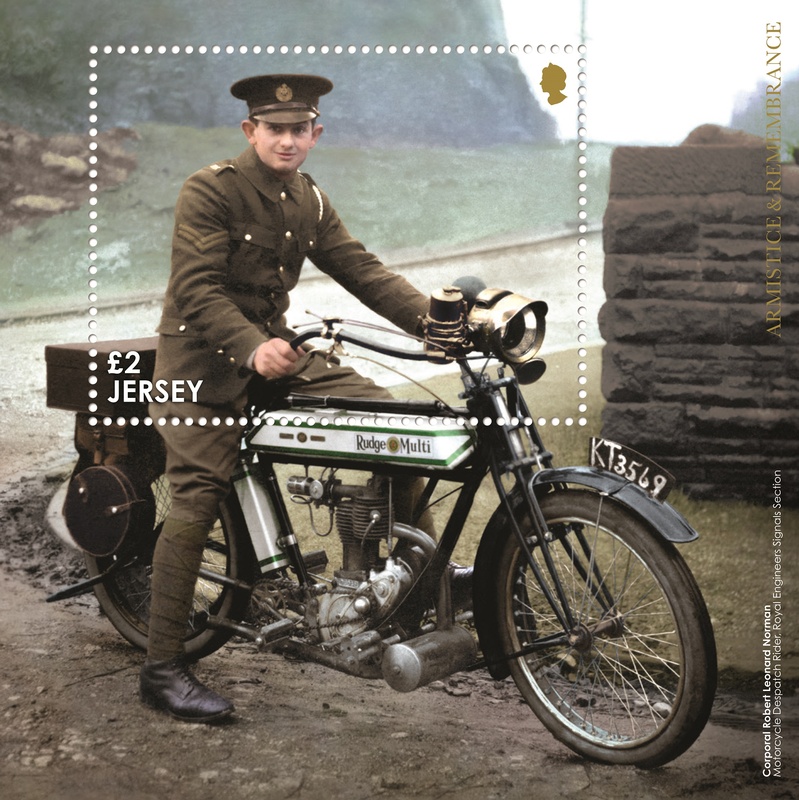 Jersey Post’s Armistice and Remembrance stamps will be available to buy from all branches of Jersey Post from 4 August 2018. 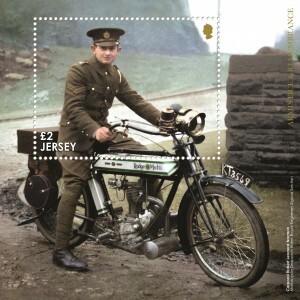 Philatelic stamp products such as Miniature Sheets, Souvenir Sheetlets, First Day Covers and Presentation Packs will be available from the Jersey Post offices at Broad Street, St Helier and Rue Des Pres, St Saviour on issue day and can be ordered now at www.jerseystamps.com or by telephoning the Jersey Philatelic Bureau on: 00 44 (0)1534 616717.